The Q4 2018 USG Corporation + U.S. Chamber of Commerce Commercial Construction Index (Index) released Dec. 11 indicates that despite staunch concerns over labor shortages and skilled workers, three-quarters of contractors believe advanced technologies may improve labor productivity on job sites. According to the Q4 report, while just over half of contractors currently use technologies like drones, equipment tagging, wearable technology and augmented/virtual reality for their projects, 74 percent anticipate adopting such technologies over the next three years. Moreover, 58 percent of contractors also reported difficulty finding skilled workers — the highest level reported in 2018 — suggesting that as builders look for ways to contend with a scarce talent pool, investments in technology could help bridge the gap of labor. In fact, if demonstrated, improved labor productivity was reported by 66 percent of contractors as the top reason for companies to invest in advanced technologies. "The construction industry has historically lagged behind others in productivity and, when confronted by the labor shortage, there is an even greater need to identify meaningful solutions that will lead to growth and innovation," said Jennifer Scanlon, president and CEO of USG Corporation. "To achieve the expected growth, it is important that contractors, architects, and designers invest in understanding how technologies like robots and 3D printing can transform jobsites and impact businesses in the near- and long-term." Notably, all the technologies included in the study are expected to increase in use over the next three years, but wearable technologies such as sensors are expected to grow the most. While only 6 percent of contractors currently report using this type of innovation, the number who anticipate its use over the next three years more than triples to 23 percent. Contractors view wearable technologies as one of the top ways to improve safety (83 percent), workforce management (56 percent), and productivity (36 percent). In general, about half of all contractors consider key project performance indicators like schedule, budgets and safety to be some of the top benefits of investing in technologies. "From the industrial revolution to the digital age, U.S. companies and workers have helped create and sustain the most dynamic and resilient economy in history. Today, our economy is being rapidly reshaped by technology and other forces," said Thomas J. Donohue, president and CEO of the U.S. Chamber of Commerce. "This transformation is creating opportunity, but too many people lack the skills or credentials they need to compete for 21st century jobs and too many businesses can't find the skilled workers they need. To maintain America's competitive advantage, it's imperative that industries and businesses adapt and leverage technology as a way to address workforce challenges." Overall, contractors are optimistic about the outlook of commercial construction with an Index score of 75 in the fourth quarter, unchanged from Q3 2018. 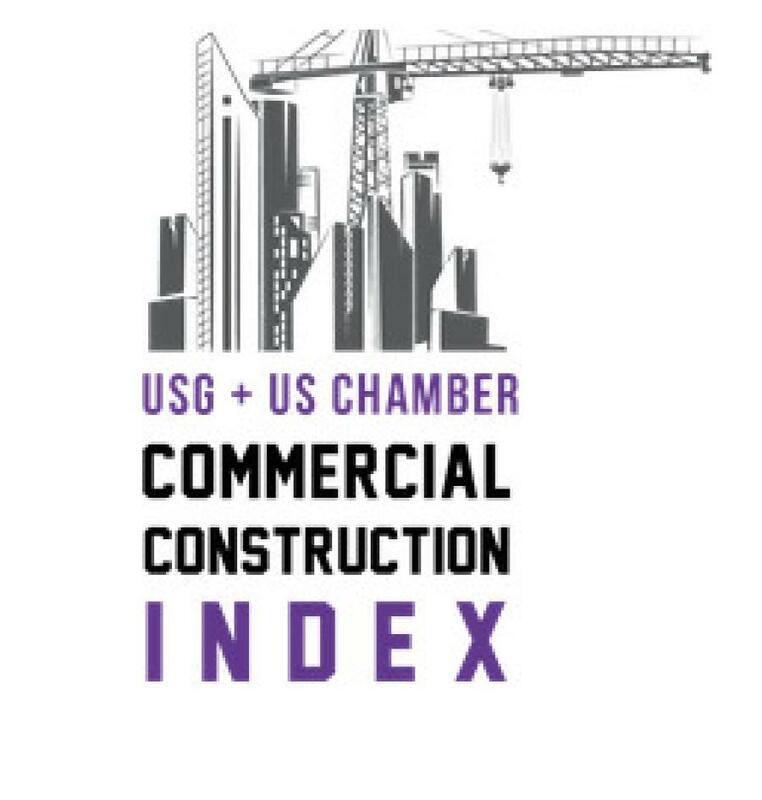 The Index looks at the results of three leading indicators to gauge confidence in the commercial construction industry — backlog levels, new business opportunities and revenue forecasts — generating a composite index on the scale of 0 to 100 that serves as an indicator of health of the contractor segment on a quarterly basis. Backlog: Contractors' ratio of actual to ideal backlog dipped slightly from 81 to 80. The average current contractor backlog was 10.0 months, down from 10.3 months last quarter. New Business: The level of overall confidence was 76, increasing quarter-over-quarter (74 in Q3 2018). Revenues: Revenue expectations remained steady at 69 quarter-over-quarter. USG Corporation is a manufacturer of building products and innovative solutions. Headquartered in Chicago, USG serves construction markets around the world through its Gypsum, Performance Materials, Ceilings and USG Boral divisions. Its wall, ceiling, flooring, sheathing and roofing products provide the solutions that enable customers to build the outstanding spaces where people live, work and play. Its USG Boral Building Products joint venture is a leading plasterboard and ceilings producer across Asia, Australasia and the Middle East. For more information, visit www.usg.com. The U.S. Chamber of Commerce is the world's largest business federation representing the interests of more than 3 million businesses of all sizes, sectors and regions, as well as state and local chambers and industry associations. For more information, visit www.uschamber.com. The full Q4 report is available for download here.